“Treat them right” with a delicious, safe Apple treat. Let them have the Apple they have been craving, in a low sugar, low starch treat! Always hand cut and baked, these wonderful Apple treats are guaranteed to be under 10% sugar and starch. Safe for horses with IR, Cushing’s, EMS or any other disease requiring a low sugar, low starch diet! The perfect all natural horse treat for the discriminating palate! Delicious Apple flavor with just a hint of cinnamon for the apple lover’s. They are rich in Omega 3′s from the human grade flaxseed. We use only stabilized flaxseed so it retains it’s nutrients. 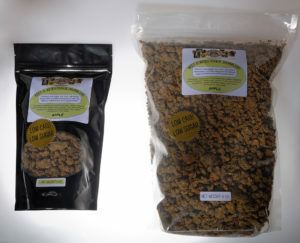 Each crunchy treat is hand cut and baked to order to ensure their freshness. You can feel good about giving them these low sugar/low starch treats. They are tested by Equi-analytical labs to be 3.3% sugar and 4.9% starch for a total ESC + starch of 8.2%. The goal is to keep ESC and starch below 10%. The 3lb bag is equal to 4-12oz bags! My mare, Dawn, adores these treats. She can’t have anything with a high sugar/starch content, so finally she has a delicious treat that is safe for her. Also, this is truly the most customer friendly company I have ever dealt with. 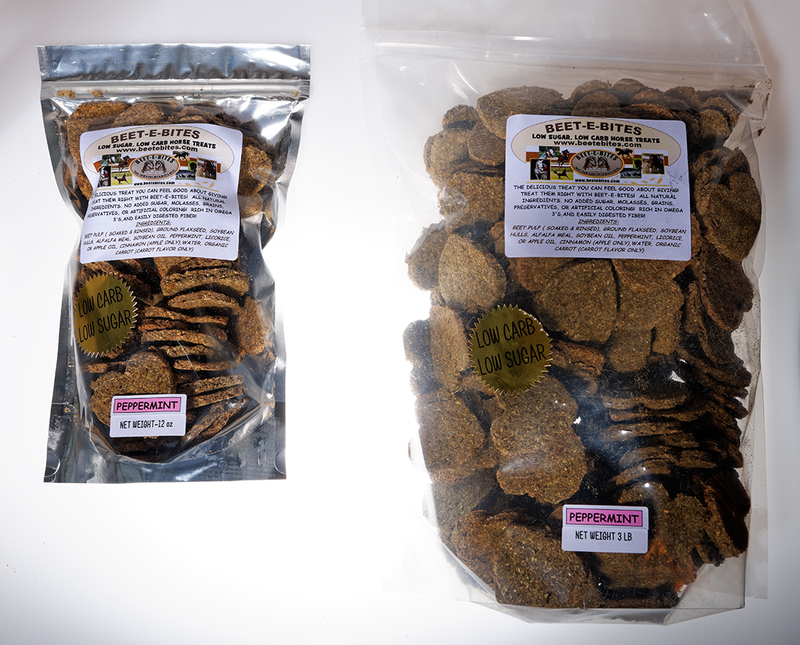 All the horses love these treats! My laminitic TWH cannot have any high sugar or high starch treats. He absolutely LOVES Beetebites. He can smell them in my pocket from a mile away. All the horses where I board readily accept these treats with gusto. Great for overweight horses too. They smell great and from the horses reactions they must taste amazing. Customer service is always helpful and friendly. The only treats I will ever buy!!!!!!! My horse is insulin resistant. He is used to getting treats before and after riding.. He used to get 4 or 5 sugar cubes. The Beetebites work well. They don’t melt in my pocket in heat and humidity, they can be broken into smaller pieces to give when he takes the bit while tacking up. We both like them. I picked apple flavor to review, however, in truth, my horses love all the flavors. My 20 year old had laminitis around 5 years ago so we have been using these treats (I think its a supplement as well) for years. My horses receive hay and these “treats” and they are very healthy. Upon ordering, I always receive a personal note from Sheri thanking me for my order as well as when they will be shipped. Nickers all around! 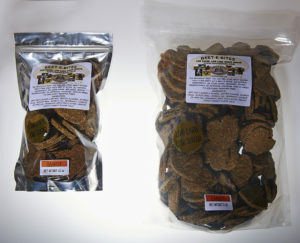 My horse loves these treats! 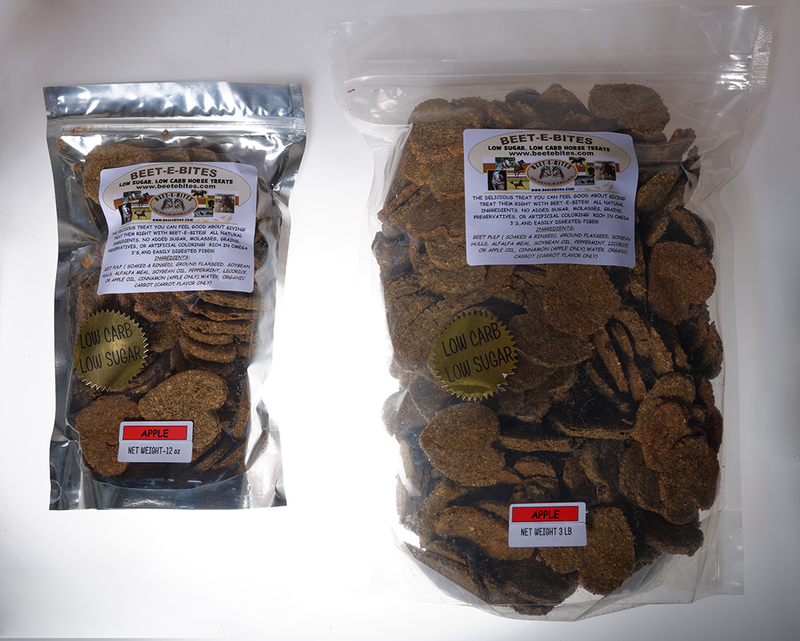 They are such a great alternative for horses that are on a low starch diet. better choice for all horses! Trojan has IR and recently diagnosed with cushings. It is so great to have treats that he loves and are good for him. Before I felt guilty giving him treats. He especially likes the apple ones. They are so handy – do not crumble or get sticky. My pony, diagnosed with Cushings last year, loves these. They are easy for me to bite into small pieces so he thinks he is getting more! I do limit him to 2-3 in a day, as, he is also on a weight loss program. Favorite is apple! Customer service is superb! My horse is 22 and has Cushing’s and EPSM. Finding a low starch treat that he would eat took a few tries, but he loves Beetebites. He will do all of his stretches, no matter how difficult for him, for an apple-flavored Beetebite–he loves them that much! I like the fact that I can easily break them into smaller pieces and keep them in my pocket without making a mess. The customer service is wonderful! Awesome Tara, so glad they love their “safe” goodies!